An Exclusive Development of 4 & 5 Bedroom Town Houses on the fringe of Manchester City Centre. A rare opportunity to own a dazzling contemporary town house with fantastic design features including: Roof Top Garden Terrace; 4 & 5 Bedrooms; 4 & 5 Bathrooms; 2 Kitchens and a Private Driveway. …and situated just minutes from Spinningfields and other key destinations of Manchester City Centre. CITY MEWS is an exciting development of nine high quality 3 & 4 storey Town Houses providing spacious and versatile accommodation certain to appeal to larger or extended families. Designed for flexibility - many houses can be configured to include a Studio, Master Bedroom Suite, Second Living Room, ‘Teenage/Granny Flat’ on the top floor. It’s rare to find such spacious and versatile accommodation so close to Manchester City Centre. KITCHENS: Specialist-designed with handleless units, Quartz stone worktops & integrated appliances. BATHROOMS: ‘Villeroy & Boch’ sanitaryware with ‘Grohe’ brassware, ‘Porcelanosa’ tiled walls. FLOORING: ‘Amtico’ & ‘Porcelanosa’ tiled flooring. GENERAL: Double Glazing, Glass Doors to Garden, Gas Central Heating, LED lighting, TV Points in all bedrooms, Wrought Iron Railings, Enclosed Rear Lawn Garden & Patio. NB: Specification may be subject to change for similar equally approved items. 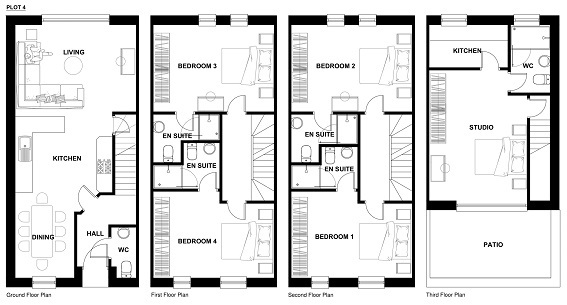 The 4 storey town house design provides flexible and versatile accommodation layouts suitable for many different uses for family living or multiple occupants. How will you configure yours? The construction of our CITY MEWS development is due to start in January 2019 with completion set for January to March 2020. Houses can be reserved now on off-plan terms for only £5,000. 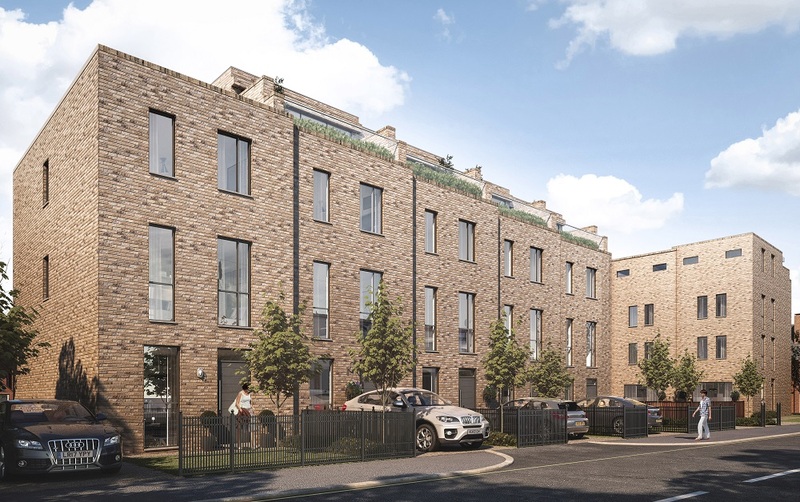 This in an exciting housing development of just nine high quality four and five bedroom town houses located on Saint Stephen’s Street in Salford, an urban suburb close to Manchester City Centre. Which plot would you like? CITY MEWS is located on Saint Stephen’s Street, a small urban residential area close to the Chapel Street area and on the boarder of Manchester City Centre. It is within easy walking distance of many popular destinations such as; The Lowry Hotel, Manchester Arena, Victoria Train Station and Spinningfields. The main designer and boutique shopping areas of King Street, St. Anne’s Square, Harvey Nichols, Selfridges are also within easy reach as is access to Manchester’s nightlife and leisure scene, in particular, the popular bars and restaurants located on and around Deansgate and the Deansgate Locks areas. Where can you find such spacious new build family accommodation with 5 bedrooms, in an area so close and convenient to Manchester City Centre? THE PROPERTY MISDESCRIPTIONS ACT 1991: References to the Tenure of a property are based on information supplied by the Developer. A Buyer is advised to obtain verification from their Solicitor before commitment. Items shown in photographs are NOT included unless specifically mentioned within the sales particulars and the purchase contract. They may however be available by separate negotiation. Buyers must check the availability of any property and make an appointment to discuss a property or view or the site before embarking on any journey to see a property. Although these particulars are thought to be materially correct their accuracy cannot be guaranteed and they do not form part of any contract. All images are CGI produced for visual effect not accuracy. 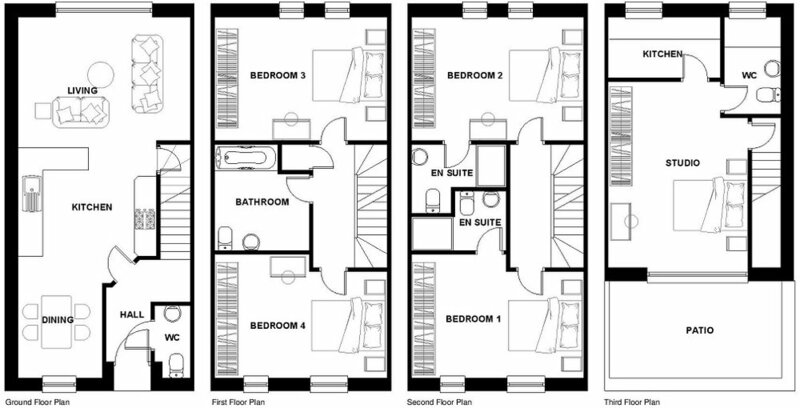 All floor plans are provided for guidance and should not be relied on as an accurate scaled drawing.